A fork-and-spoon motif is often part of the merchandising and signage upon entrance to Target®. I am not sure if the concept is based totally upon the “dig in” theme or the fact that foodstuffs are often among the entry specials. I do know that a Target® logo is stamped into the flatware handle for good luck. 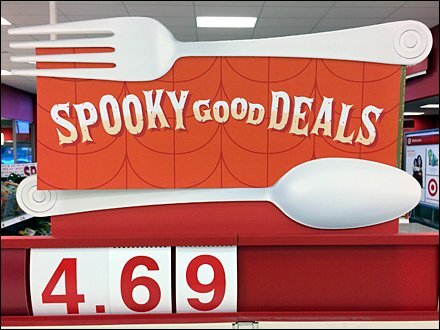 Scroll down for more Halloween and Target® outfitting and merchandising.